To learn more about the concept of providing children with welcome packages, toys and products on check-in go to Welcome Package Concept. In continuing our commitment to safety for children while travelling, we advise that some products be used only for children over the age of 3. Products for Children under 3 are also available. We monitor recall notices for products we provide our clients. 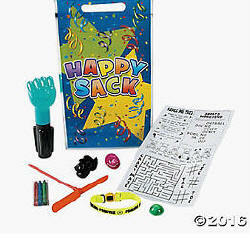 Each pre-filled Happy Sack™ goody bag includes assorted novelties. Pre-made goodie bags. 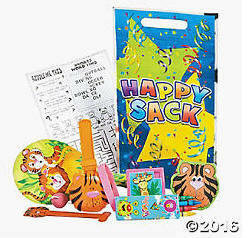 Each goody bag includes assorted novelties. Pre-made goodie bags. 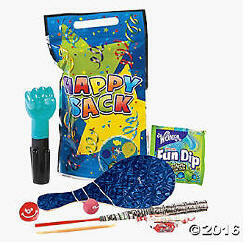 Each goody bag includes assorted novelties and candy. The following is a sampling of the selection of active and learning toys available that can be matched to a theme and included in prepackaged or self-packaged Welcome Packages for Children. 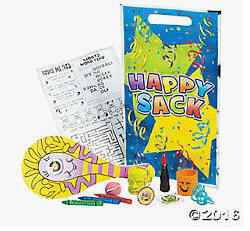 We can customize and include products designed around your Hotel or Resort’s Children’s Theme or help you create a theme. 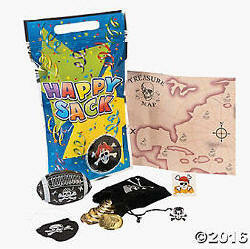 Products can also be used with a Treasure Chest to allow children to pick a prize or as prize giveaways. 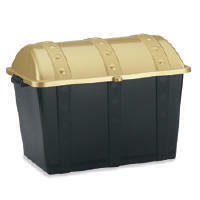 Scroll the Page to view Product Selection - Many more products are also available. Contact us for your special needs. THESE PRODUCTS ARE NOT INTENDED FOR CHILDREN UNDER 3 YEARS OF AGE. Fax Us at (905) 985-4564 with an order form with Visa/Mastercard particulars - Visa/Mastercard No., Expiry, name on card and signature. As any parent can tell you, while family vacations can be great fun and provide unforgettable family memories, there are those times when everyone's patience may wear thin. One of those occasions is when the family arrives at a hotel or resort to check-in. Parents are tired from the trip, whether it be by car, train, bus or airplane. Kids are full of energy from being cooped up and have energy to burn. You can treat the entire family as guests at your hotel by providing the Kids with a welcome package. Relief floods the parents' faces and glee shines on the kids, as mom or dad can check in at the front desk in peace while the kids are busy checking out the package they just received. Add a lobby play area - see Play Area Products and Information. Taking it one step further, once the family enters their hotel room, parents can relax, settle in and unwind while the kids are busy playing, exploring or sharing something new. Other hotel guests, who may not have brought their children with them will see what fun the kids are having and decide to come back again with their kids. Other guests will appreciate less commotion in the lobby area, especially during busy periods. Parents will be thankful for your hotel welcoming their children. Staff will look forward to providing the children with the welcome packages and managing the check in of a family will proceed in a more relaxed manner. Staff and management will appreciate the greater level of guest satisfaction. Creating a theme for your hotel or hotel chain as part of a promotional campaign will be a magnet for travelling families which can establish and develop into ongoing relationships with families. Launching innovative additions to the themed products or introducing contests will attract kids and parents alike, to visit again. Hotel chain based themes provide an even broader range of promotional opportunities, increasing exposure and reducing the individual hotel financial outlay. Imprinted products accompanying a theme extend the reach of the promotion by advertising the unique themed products to other children and families away from the hotel and bringing back memories reminding families about their vacation at your property. This can trigger a return visit. We can design a theme with accompanying products or provide products that will enhance an established theme. While some products may be attractive for both boys a nd girls, we can also provide products and themes designed to please both genders or gender specific. While some products may be suitable for all ages, we also have age appropriate products, including products specifically designed for infants. Time and again it can be shown that attracting the kids attracts the parents and pleasing the kids, pleases the parents. Take advantage of this powerful marketing tool and let the Hotel Fun 4 Kids™ Program, Products and Services help you develop and promote it. Go to HOTEL FUN 4 KIDS SERVICES to learn more.